Typically, the brides are the ones who contact me first about engagement or wedding photography. When I received an inquiry from Mike about photographing he and Natalie’s Philly wedding, I was right away impressed with his outreach and thoroughness (you picked a good one, Natalie!). I spoke with both of them on the phone first, and I knew right away that I wanted to shoot their wedding. We then met in person in Cherry Hill, NJ, and we hit it off instantly! I knew their wedding day would be a fun one. After all, they picked some of Philadelphia’s most iconic wedding photography spots, including the church from the movie The Sixth Sense, so how could I not have the best time shooting in such awesome spaces? We started the day at the Loews Hotel, right in Center City Philadelphia. It’s always tricky, in the best way possible, when the bride and groom are staying in the same hotel. There’s a lot of sneaking around to make sure nobody sees each other before the First Look - it makes me feel like I’m in the Secret Service, escorting the bride and the groom in secrecy! Natalie was so laid back and easygoing that I was able to just do my thing and get some incredible shots of the bridal party getting ready. Everyone was so excited all day long, and the bridal party even helped me out with getting some key shots - they made it so easy for me! 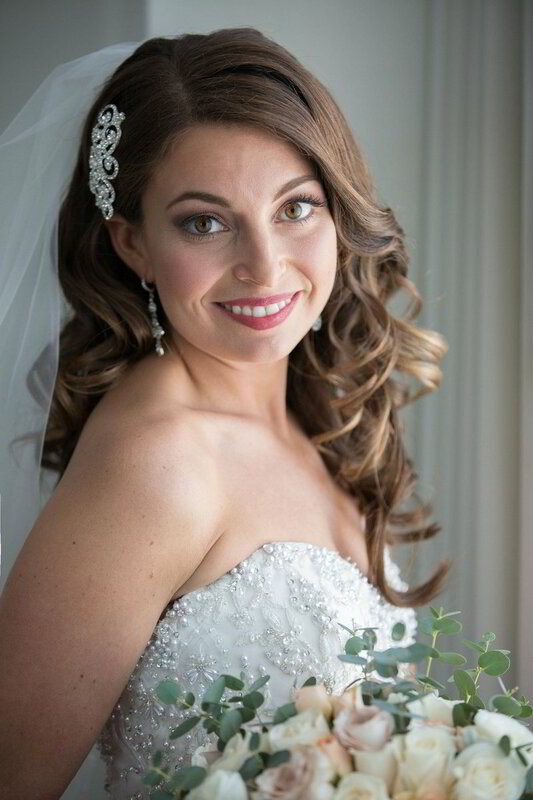 We had plenty of time and got some beautiful shots of the bride, groom, and everyone in their bridal party. "Damon was truly the best! As a bride who was very excited on the big day, Damon's calm energy made me feel very comfortable, he captured all of the magic of our big day. You can't go wrong booking Damon. He was so easy to work with and communicated very professionally and was prompt with all questions. Our favorite part was when Damon let us know that our photos were completed when we were on our honeymoon. His work is fantastic and he has a great eye. We are so pleased with our wedding photos!" The wedding hashtag was #LoveStoned, and it couldn’t have been more applicable to Mike and Natalie when they first saw each other at their First Look. They were so enamored with each other. 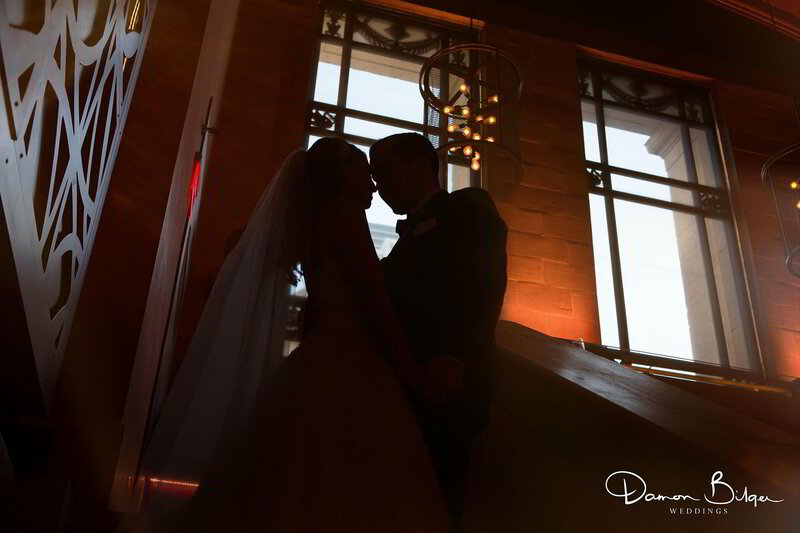 The lighting was perfect with amazing side light coming in from the windows of the hotel’s long corridor, and the view of the Philly skyline from here was so cool! Remember how I mentioned we got shots at a lot of Philly’s most iconic spots? In addition to the Loews Hotel, one of Philly’s finest, we got some shots at Race Street Pier, with amazing views of the Ben Franklin Bridge, and of course, “the shot” right in the middle of Broad Street with City Hall in the background! The best part was how many spectators were around as we took the photos. Everyone loves a wedding, and it’s always fun for all of us to have an audience for a bit! One of my favorite wedding photos to capture with every bride is the veil blowing in the wind. It’s such a fun shot, and involves multiple people and perfect timing. One of the bridesmaids threw the veil, and I was there snapping away to get the ideal shot. It’s always a photo that’s worth the effort and teamwork! I geeked out when we got to the ceremony - after all, it was such a recognizable spot! Old City’s St. Augustine Church is not only on the National Register of Historic Places, but it’s famous for being in M. Night Shyamalan’s breakout movie The Sixth Sense. It was really beautiful inside, and I even managed to find time to go up to the balcony to get a few wide shots. The ceremony music was exceptional - Mike and Natalie booked a three-piece group featuring a piano, violin, and singer. It was so clear that Natalie and Mike were having an amazing time at their wedding reception at Union Trust in Philly - they had smiles on their faces the whole time, and so did everyone else, making my job of capturing the moments so simple, because everyone was so happy! With an exit filled with sparklers and cheers from friends and family, it really was a grand finale to an incredible day with an awesome people. Congrats, Natalie and Mike! View our packages to help you get started, or customize your own package for complete wedding day coverage!